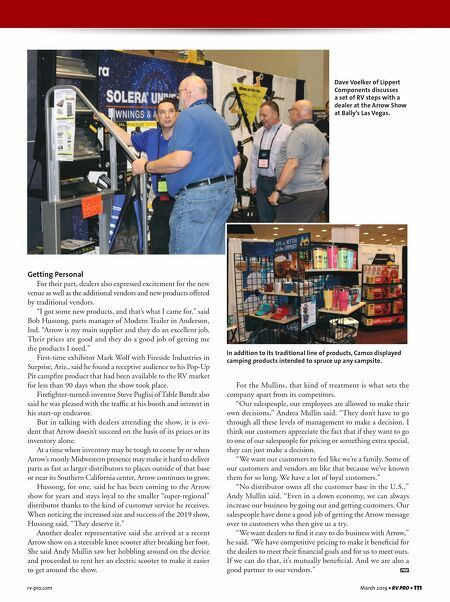 rv-pro.com March 2019 • RV PRO • 111 rv-pro.com March 2019 • RV PRO • 111 Getting Personal For their part, dealers also expressed excitement for the new venue as well as the additional vendors and new products offered by traditional vendors. "I got some new products, and that's what I came for," said Bob Hussong, parts manager of Modern Trailer in Anderson, Ind. "Arrow is my main supplier and they do an excellent job. Their prices are good and they do a good job of getting me the products I need." 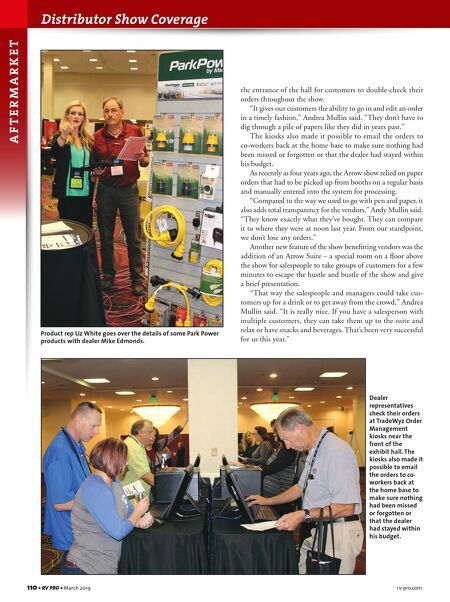 First-time exhibitor Mark Wolf with Fireside Industries in Surprise, Ariz., said he found a receptive audience to his Pop-Up Pit campfire product that had been available to the RV market for less than 90 days when the show took place. Firefighter-turned-inventor Steve Puglisi of Table Bandz also said he was pleased with the traffic at his booth and interest in his start-up endeavor. But in talking with dealers attending the show, it is evi- dent that Arrow doesn't succeed on the basis of its prices or its inventory alone. At a time when inventory may be tough to come by or when Arrow's mostly Midwestern presence may make it hard to deliver parts as fast as larger distributors to places outside of that base or near its Southern California center, Arrow continues to grow. Hussong, for one, said he has been coming to the Arrow show for years and stays loyal to the smaller "super-regional" distributor thanks to the kind of customer service he receives. When noticing the increased size and success of the 2019 show, Hussong said, "They deserve it." Another dealer representative said she arrived at a recent Arrow show on a steerable knee scooter after breaking her foot. She said Andy Mullin saw her hobbling around on the device and proceeded to rent her an electric scooter to make it easier to get around the show. For the Mullins, that kind of treatment is what sets the company apart from its competitors. "Our salespeople, our employees are allowed to make their own decisions," Andrea Mullin said. "They don't have to go through all these levels of management to make a decision. I think our customers appreciate the fact that if they want to go to one of our salespeople for pricing or something extra special, they can just make a decision. "We want our customers to feel like we're a family. Some of our customers and vendors are like that because we've known them for so long. We have a lot of loyal customers." "No distributor owns all the customer base in the U.S.," Andy Mullin said. "Even in a down economy, we can always increase our business by going out and getting customers. Our salespeople have done a good job of getting the Arrow message over to customers who then give us a try. "We want dealers to find it easy to do business with Arrow," he said. "We have competitive pricing to make it beneficial for the dealers to meet their financial goals and for us to meet ours. If we can do that, it's mutually beneficial. And we are also a good partner to our vendors." In addition to its traditional line of products, Camco displayed camping products intended to spruce up any campsite. Dave Voelker of Lippert Components discusses a set of RV steps with a dealer at the Arrow Show at Bally's Las Vegas.